165,000 Jobs Added In April, Jobless Rate Fell To 7.5 Percent : The Two-Way The eagerly anticipated news was better than expected. And the Bureau of Labor Statistics revised upward its estimates of job growth in February and March. Waiting for work: Job seekers lined up last month at the 25th Annual CUNY big Apple Job and Internship Fair in Manhattan. 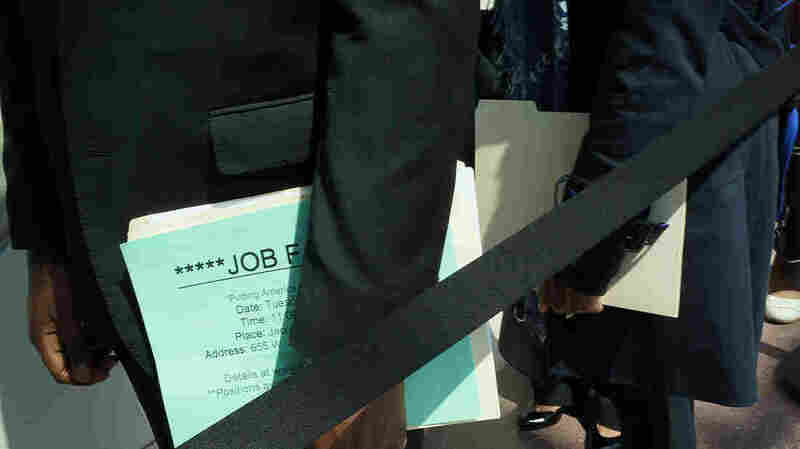 The nation's jobless rate edged down to 7.5 percent in April from 7.6 percent in March and employers added 165,000 jobs to their payrolls last month, the Bureau of Labor Statistics reported Friday morning. The news was better than economists were expecting. Before the report's release, economists thought BLS would say that 140,000 to 150,000 jobs were added to payrolls last month and that the jobless rate remained unchanged. Deeper into the report, there was also good news about previous months. The bureau now says there were an estimated 332,000 jobs added to payrolls in February and 138,000 added in March. Both figures are substantial increases from previous estimates — of 268,000 jobs added in February and just 88,000 in March. Still, job growth since the economy emerged from recession in mid-2009 has been more modest than during other recoveries. We'll have more from the report and reactions to it as the morning continues. Figuring how why the stock market goes up or down is always complicated, but as The Wall Street Journal and others are pointing out, the employment report does seem to be the major reason why stock indexes are up sharply. The Dow Jones industrial average is in record-high territory and looks like it could close above 15,000 for the first time. The S&P 500 might end the day above 1,600 for the first time. "There's some good news in today's report, but the president's policies still aren't providing the robust economic growth and job creation the American people desperately need," House Speaker John Boehner, R-Ohio, says in a statement distributed by his office. "While more work remains to be done, today's employment report provides further evidence that the U.S. economy is continuing to recover from the worst downturn since the Great Depression," the president's top economic adviser, Alan Krueger, writes on the White House blog. Update at 9:22 a.m. ET. "Good News, But It Should Be Better." "Good news but it should be better." Update at 9:15 a.m. ET. Where Was Most Of The Growth? -- "Professional and business services" firms added 73,000 jobs, of which 30,800 were at temporary help providers. -- "Leisure and hospitality" companies added 43,000. -- Health care and social assistance firms added 26,100. "With an increase of 165,000 jobs in April, and following the significant upward revisions for February and March, the job market looks better than expected despite the sequester or issues like the rising cost of providing health care benefits," says Conference Board economist Kathy Bostjancic in a statement sent to reporters. Paraphrasing Mark Twain, TD Securities global head of research Eric Green tells Bloomberg News that "the demise of this recovery is grossly exaggerated. ... We're still in a soft patch, but the job market is not falling apart. The U.S. labor market is in much better shape than most people feared." "The economy has created an average of 208,000 jobs a month from November through April," The Associated Press notes, which is more than the 138,000 average in previous six months. At 7.5 percent, the unemployment rate remains at the lowest level it's been since December 2007's 7.3 percent. That was the month the economy sank into its latest recession (which technically ended in the early summer of 2009). The jobless rate's recent peak was 10 percent, in October 2009. Unemployment rates often continue to rise even after the economy starts to heal because employers remain wary of adding on workers. One defining feature of the economy's post-2009 recovery has been the continued reluctance of employers to add on large numbers of employees. That's why the jobless rate has come down less, and more slowly, than after some other recessions. The bureau now says there were an estimated 332,000 jobs added to payrolls in February and 138,000 added in March. Both figures are substantial increases from the bureau's previous estimates — of 268,000 jobs added in February and just 88,000 in March. Related post from Planet Money: Millions Of Americans Are Leaving The Workforce. Why?